Siege Catapult can't attack unless your side of its lane is full. 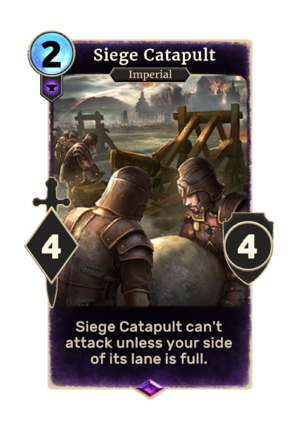 Siege Catapult is an epic Endurance creature card. It is part of the Core Set. This card was nerfed from a 5/5 to a 4/4 in Patch 2.8. This page was last modified on 24 March 2019, at 21:10.